Elaine F. White, 69, of Holliston, passed away Sunday, March 24, 2019 at Milford Regional Medical Center after a period of declining health. Born in Framingham, she was the daughter of the late Bertha (Kimball) and Earl Elliott. She was the wife of the late Paul J. White. 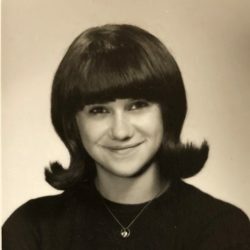 Elaine was a 1967 graduate of Holliston High School and married 42 years to her high school sweetheart, Paul. They resided in their hometown of Holliston to raise their family. With her husband, they owned Design Associates and Manufacturing Company in Holliston. Together they also founded another successful Holliston business replicating miniature historical buildings in town called Mouse House Village. Before her retirement she most recently was a medical typist at Goldstein Dermatology in Natick, MA. She was a talented seamstress who made matching outfits for her and her preschool daughters. She loved to cross stitch, knit, crochet and also enjoyed working as an upholsterer. Elaine cherished relaxing time spent with her family on the lakes and beaches of New England. She took pleasure in her many years of deep sea fishing with friends on “The Annie B” off of Cape Cod. Throughout her years, Elaine was an active supporter of the local chapter of Relay for Life as well as a generous contributor to many of her favorite charities. Elaine is survived by three loving children, Laurie Alexander and her husband, John of Holliston, Wendy Willis and her husband, Mark of Mendon, and David White of Holliston. She also leaves behind 5 special granddaughters, Taylor and Ashley Alexander, Madison and Skye White, and Hailey Willis. Elaine is survived by her siblings, Earl Elliott Jr. and his wife, Brenda of GA, Wayne Elliott of Gardner MA, and Gary Elliott of Holliston. She will also be missed by her sister-in-law, Karen (White) LaPan, and brothers-in-law, Ronald and Michael White, in addition to many nieces and nephews. Visiting hours will be held Saturday, March 30th from 10-12 with a funeral service to follow at Chesmore Funeral Home of Holliston, 854 Washington St. www.ChesmoreFuneralHome.com In lieu of flowers, expressions of sympathy may be made in memory of Elaine F. White to The Milford Regional Medical Center/Pulmonary Rehab Program, Hill Building, 14 Prospect Street, Milford, MA 01757.